Blacks and Hispanics distrust the media when it comes to reporting news and general information about their respective communities in a factual and balanced way. In fact, a new study shows a large majority of black and Hispanic news consumers don't fully trust the media to portray their communities accurately, a statistic that could be troubling for the news industry as the minority population of the United States grows. When asked whether they thought news about their communities was accurate, 75 percent of blacks said only "moderately" or "slightly/not at all." When Hispanics were asked the same question, 66 percent replied "moderately" or "slightly/not at all." Tia C. M. Tyree, a Howard University professor and the assistant chair of the university's department of Strategic, Legal and Management Communications, said the stereotyping of blacks and Hispanics in the media, and a distrust of systems in the United States that used to be rife with racism contribute to the distrust. "Many will believe there is embedded racism in many of America's systems: the media system, the legal system, the educational system," she said. "Many will believe that minorities aren't treated fairly in those systems, and because of that, any products that come out of it will be problematic." Tyree also pointed at the small number of blacks and Hispanics in the media, saying that affects the viewpoint of the product. "It matters who the owners are, it matters who the producers are, it matters who the editors are, because that's often the agenda or the slant of the media and the news coverage," she said. African-American consumers felt they could find the largest amount of news about their communities on local media. Twenty-three percent named a local television station as providing the most news about their communities, 15 percent named the black press, and 9 percent named newspapers. 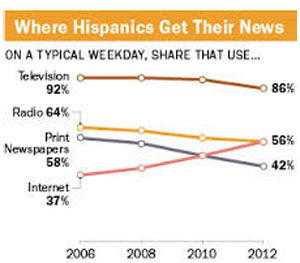 Hispanics by far - 41 percent - view Hispanic-specific news sources as the most frequent providers of information about their communities, 10 percent named 24-hour news stations 7 percent named a local news station. "There isn't an analogous, what you might call 'ethnic' press (for blacks) that has evolved as the Internet has evolved - it's been more of a disruptive medium - while the Hispanic media has sort of adapted and grown," Rosenstiel said. The news industry needs to figure out how to reach these consumers of color, Rosenstiel said. "They're affluent, they're attractive to advertisers, there's a market there," he said. Follow Jesse J. Holland on Twitter. I believe that the media today especially the daily news channels focus on the minorities. There are neighborhoods that have a negative connotation to them and they are typically of the African American race or Hispanic. This is unfortunate because there are people that live in those areas that are doing the right thing and living their life whereas others in the are are not. The stereotypical neighborhood like West Bottoms for example has that view about them and typically are known for fighting, even killing by a number of people in the area. The ones that are doing their best to get by have a generalization about them. It's almost as the news channels are biased towards the neighborhoods that have a stereotype placed on them. This could be for lots of reasons. The news could be hiding stories from other neighborhoods and choose to put the stories up about that one particular neighborhood where many people believe all the bad things happen there. Kansas City is known not to be the safest city and I therefore choose not to watch the daily news because it has many stories about assaults, robberies and generally unpleasant stories. I agree when saying that the media targets certain neighborhoods or communities. Like you said unfortunatley it is minorities a lot of the time. Where I think controversy begins is when it is said that the information released is not always accurate. I think that when talking about crime and what goes on the media does a good job of reporting the facts. I think that instead of accusing the media of false accusation it should be noticed that in low income or unsafe neighborhoods of white people the media never reports anything about it. In that case it makes it seem that all white communities have lower crime rate and are the "better neighborhoods" to live in. In this case I would say that the media is racially biased. Indeed many areas with a population of minority's get poor representation in the news. Largely due to the crime rate in these areas. Sadly the news usually only reports on the bad things in society. We also don't consider that its not the race of the people living in these areas but the issue is the poverty in the area that leads to these crimes. I agree in the sense that the media targets areas and communities. By doing this it implies that the race that lives within the community it not as good as other races. You never see low income white neighborhoods on the news? Why is that? It raises questions about racism and it being present in the way the media reports information to the public. They are not giving all the information about all neighborhoods. They are focusing on the ones that already have bad reputations, which are usually of African American and Hispanic people. Why even trust the news? Who are we to trust the news stations? Indeed the media portrays many people in a bad light and there isn't much we can do about it. I think we should always take the news stories with a grain of salt because they are never entirely true. Don't get me wrong but there are media to be trusted and then there's media who are just looking for attention and look to create a spark out of every issue they can find. Some media stories are true while others are not but it's up to us to research the news or articles that represent the what issues are being dealt with. On the other hand, on a personal level I believe that part of the reason is that minorities have traditionally had only marginal presence and even less influence within the mainstream media. While these breakthroughs are certainly welcome, the very crazy acceptance of such featured figures symbolizes the frustration that minorities still feel about the delays and continued slowness of progress within the mainstream news media.So I believe the minorities, Blacks and Hispanic have an obligation to voice their opinion about this survey because it is unfair to them. This is why I still believe racism is very much in the air still in the United States but those who have their own beliefs would stay quiet because it may cause an uproar to the people around them. The news is wrong 99% of the time in my opinion. There have been many situations where I have been watching the news and was a part of or was an insider in an event they were talking about, and they were always stretching the truth or straight up lying about it. Most of the time they don't even know what they are talking about and they need to do way more investigating than they had done to get the false information that they had. From Above "take the news with a grain of salt"